A decorative painting for tea lovers and green lovers. I wanted to keep a part of the painting abstract and play on color vibration. This way I can still imagine a lot of possible landscape. I'll print it for my kitchen, around 50cm height. Also, it's a mini tribute to the Orphism art period, especially for the canvas of Robert and Sonia Delaunay ; so generous in colors. My heart melt each time I cross one artwork of them in a museum. Krita for drawing and painting and Gmic plugin ( from Gimp ) for shape research and color tweaks. License: CC-BY-NC-ND David Revoy, www.davidrevoy.com, 26 april 2014 . I like it! This painting could hang in my kitchen as well^^ I think it is an interesting contrast of "hard" lines from the cubistic part and the soft curves of the woman. It is nice, to see you experimenting with abstract forms and styles. 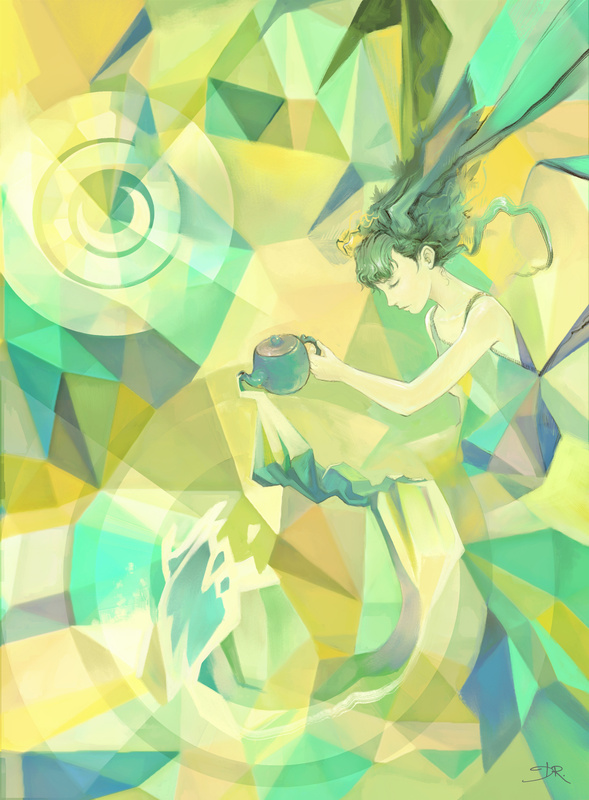 David Revoy, please, may you say me how to make this polygon-style illustration, because i think that this style of illustration is very elegant! And... Sorry for my bad english! I'm brazilian! 5. Now paint over, for more gradient, and developp own shapes. Fantastic work. I love green tea. Very impressive! I love the colors of your work.